I’m 37 and I’ve had migraines for my entire life. When I was a child, I couldn’t swallow pills and I couldn’t take soluble aspirin, so I used to get light sensitive and vomit and have to sleep it off on a regular basis. I missed a lot of quarter or half days of school. I remember that I used to stay home until I felt better, then go to school for the rest of the day. 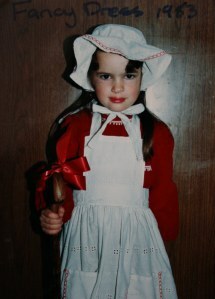 Me at 5 in the dress at the Fancy Dress. The migraine hadn’t started yet. This entry was posted in On Migraines. Bookmark the permalink.